Not to be confused with the Power Armor, Octoling Armor, or the Armor Replica set. Armor (or armour(EU)[a]) is a protective collectible in Octo Valley, Octo Canyon and the Octo Expansion. The armor is automatically worn by the player when picked up. Armor comes in a small briefcase-like collectible in single-player Octo Valley and Octo Canyon missions. It is comprised of three parts: the Armor Helmet, the Armor Jacket, and the Armor Boots. The Armor Helmet consists of the triangular earpieces from the Hero Suit, but with a helmet worn with them, similar to a bicycle helmet but very long and pointed at the back. The back of the helmet and the fronts of the earpieces have glowing lights on them that change color depending on the number of pieces of armor equipped, and a black strap is buckled at the chin. Also depending on the number of pieces equipped are antennae, which appear on the sides of the helmet. The Armor Jacket is a thick down jacket with a large collar. It is black on the sleeves and the upper portion, but a vivid green from the armpits down. On the elbows and the left side of the chest are subtle dot patterns that change color depending on the number of pieces equipped. There is also a small set of fishing lures hanging from the wearer's waist, which, as the Splatoon artbook reveals, is meant to attract the opposite gender. The Armor Boots are thickly padded boots that are mostly black on the outside with white interiors. They have thick, light gray soles and are secured to the wearer's feet by three vivid green straps, each with a white and gray arrow on it. Two of these straps are fastened to the top of the base of the shoe, with the third around the ankle. Just above the heel is a line of subtle dots that change color depending on the number of pieces equipped. Replicas of the first set can be obtained as the Armor Helmet Replica, Armor Jacket Replica and the Armor Boot Replicas by talking to Judd at Levels 25, 30, and 35 consecutively to use in multiplayer battles in Splatoon, and as rewards from the Marie amiibo in Splatoon 2. In Octo Canyon, Agent 4 can only hold up to two sets of Armor, but the basic Hero Suit acts similar to armor as well. If Agent 4 gets hit while in the basic Hero Suit, they will leave a burst of their own ink and will have their movement slowed down. They can quickly recover by picking up armor, collecting a Mini Zapfish, or reaching a checkpoint, or after enough time has passed for the suit to self-repair. Swimming or hiding in ink will shorten the amount of time that the armor needs in order to self-repair. The Armor Helmet is a round black bike helmet with holes on top of the headphones. If two sets of armor are picked up, the Helmet is similar to the one from the first game but much smaller and more streamlined with a colorful reflective surface all over it. There is now a clear visor that protects the eyes; the helmet seems to have been designed by Toni Kensa as the logo for most of the clothes under its brand is seen on the back of the helmet. The Armor Jacket is a silver reflective jacket with long cuffs with the hoodie's hood from it still visible. When two sets of armor are picked up, the jacket turns black and silver, padded, and now covers the neck, similar to the first game, with several logos around it. The cuffs then cover the player's palms like a glove. The Armor Snowboots remain the same throughout, but the Shorts will change from the basic pair to the same pair of shorts that Agent 4 wears with tights under it and knee pads if two are picked up, or what seems to be the option of the shorts and tights for boys without the shorts if the player is male or female, respectively. Unlike most other exclusive gear used in single-player modes, replicas of the armor in Splatoon 2 cannot be unlocked for use in multiplayer. In the Octo Expansion, armor comes in armored rectangular briefcases with the Kamabo logo on the front that Agent 8 can pick up. Like how other armor resembles bike safety gear, the armor in the Octo Expansion resembles motorcycle protection gear. When two sets of armor are picked up, it resembles hi-tech black security armor, known as Null Armor. Unlike in Octo Canyon, having the armor at the end of the mission does not give Agent 8 bonus Power Eggs or CQ Points. The armor is made up of a Visor, the Armor itself, and Boots. 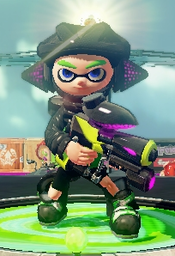 Like Splatoon 2's regular Hero Mode, Agent 8 can only pick up two armor sets at a time and their suit that they wear whenever they have no armor on functions identically to the basic Hero Suit that Agent 4 wears. The Visor is more spherical compared to the other helmets and white with a clear face mask with a small Kamabo logo on the back of it and just above face mask as well as each half of it on the sides of the face mask. The Null Visor is black and resembles a racing helmet with several stickers stuck around, it covers the mouth and has a visor over the eyes. The Armor is a white chest plate with two pairs of black slits on the front with a Kamabo logo on the center. There is also a jacket underneath that reaches to the waist with two pockets that are accented with Agent 8's current ink color, with sleek and padded sleeves. The Null Armor is a black version of the chest plate with shoulder pads and sleeves doubling as fingerless gloves. The Boots are white and gray and go up to the knees with the Kamabo logo on both of the shinguards. Their shape is much slimmer than the Snowboots and they cover Agent 8's tag on their right ankle. The Null Boots are a black version and have a white logo of Kamabo and with spots around the sole with Agent 8's ink color. Replicas of the second piece can be obtained as the Null Visor Replica, Null Armor Replica and the Null Boots Replica by collecting four, five and six sets of mem cakes, respectively, then speaking to Iso Padre and beating the Octo Expansion. Armor prevents enemy attacks from splatting the player. If the player takes enough damage that would otherwise splat them, an armor set breaks instead and they cannot be damaged for a short time after the break, shown by a flashing effect. However, armor provides no protection against falling into water or out of bounds and will cause the player to respawn with no armor. Having it on at the end of a mission in Octo Valley and Octo Canyon awards a bonus of ten Power Eggs. This bonus is always ten, regardless of the number of pieces worn. Going from early concept art, it seems that armor was originally worn with the normal Hero Runners, instead of the Armor Boots. According to The Art of Splatoon, the Armor Jacket is lightweight and preserves body heat. Agent 3 next to a briefcase containing armor. The case containing armor in the Octo Expansion. This page was last edited on 23 April 2019, at 15:02.